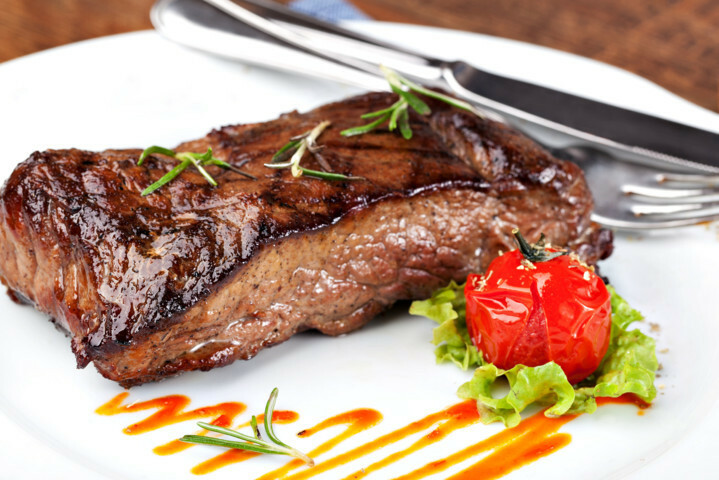 Remove steaks from the refrigerator, and let sit, covered, at room temperature for 20 minutes before grilling. Meanwhile, combine oil and garlic in a small saucepan. Warm over low heat for 2 minutes. Remove from heat, and let sit for 15 minutes. Whisk together coconut cream, horseradish, chives, 1/4 teaspoon salt, and 1/4 teaspoon pepper in a small bowl. Cover and refrigerate. Brush each steak on both sides with 1 teaspoon garlic oil, and season with remaining 1/2 teaspoon salt and 1/4 teaspoon pepper. Place steaks on the grill, and cook over high heat for 4–5 minutes, brushing with the oil every minute or so until golden brown and slightly charred. Turn the steaks over, and continue grilling for 5–6 minutes or until internal temperature reaches at least 145° (medium-rare). Transfer steaks to a platter, tent with foil, and let rest for 5 minutes before slicing. Serve with horseradish sauce on the side.